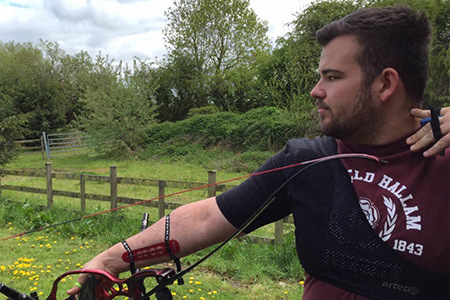 I am a 21 year old recurve archer I am currently based in South-Yorkshire England whilst at University, having started shooting at the start of 2014. I initially was self- taught, but after joining my university team in 2014 I was told to come to GB and train and enter more competing. This is where I got introduced to Artebo products, and intently loved their products. Over the couple of years since I've been shooting I've achieved quite a lot, consistently earned medals/awards at multiple shoots, also I just came short for getting a new PB this year of 1200 in a men's Fita. I have just finished my program with the National Talent Development Programme, and now have been told to qualify for selection shoots and to keep my progress up.